Earlier this summer, on the second anniversary of the New Horizons Pluto flyby, I tweeted that “Pluto became a real place, and we will never see the solar system the same way.” New Horizons was and is a capstone mission, exploring the final major world that humanity set out to explore at the dawn of the space age and is now on its way to making the first close-up observations of an object in the solar system beyond. Much was made of the Pluto encounter occurring fifty years after Mariner 4 began humanity’s quest to see the solar system beyond the Earth-Moon system with remote eyes, the reconnaissance of the solar system known at the outset was complete. Of the eight planets that received their visits of the first time, four of them - half - were transformed by one mission, as were the overwhelming majority of moons. Consisting of two spacecraft, the Voyagers brought into focus more planetary real estate (or at least cloud estate) than all other missions combined. I am of course aware that Pioneers 10 and 11 were the first to Jupiter and Saturn, but despite my fondness for these missions, they carried no real camera, merely a scanning photometer, that, while showing us fascinating unearthly angles, did not upend our conception of either planet or their moons. While their particle and fields instruments provided a wealth of discoveries, gaining a feeling of what it is like to be in their presence was left to the Voyagers. The four Voyager planets – Jupiter, Saturn, Uranus, and Neptune – are by far the largest. They are accompanied by six planet-sized moons, as well as many that aren’t far from it. Hence, in the months, weeks, and days leading up to the flybys, a stream of images came back revealing an ever-clearer view of these worlds. The early press release images, blown up to aid visibility and hence fuzzy, were constantly replaced with ones that were a bit sharper. Because the images that the public saw got clearer rather than larger as the encounter approached, it almost seemed like the Voyagers’ cameras were slowly focusing rather than flying toward their targets. Since this was a time when terms like “pixel” were largely relegated to tech jargon, it wasn’t as obvious what was being done to those images early on. In the final days, the moons would go through a much faster version of the same process. 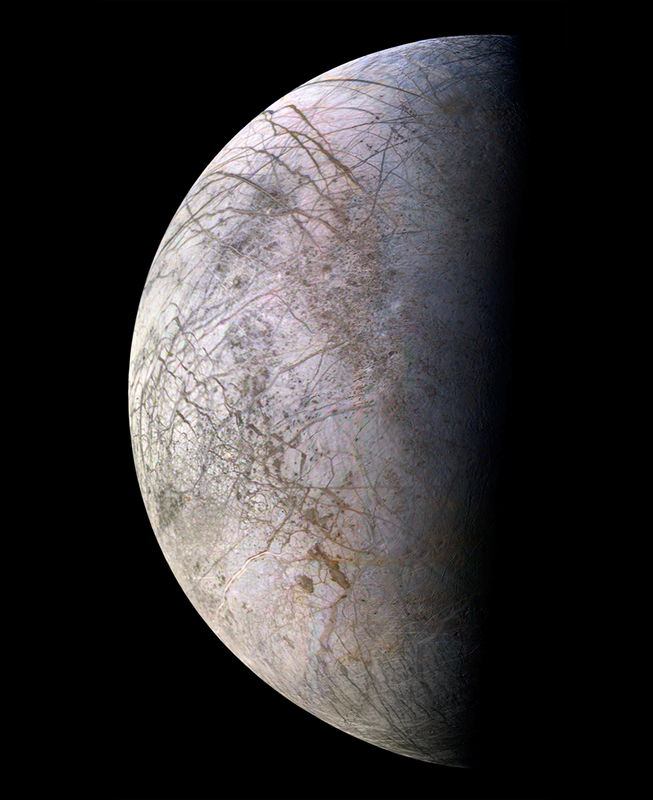 Voyager 1 saw Europa only distantly. It took the Voyager 2 flyby on July 9, 1979 to reveal the nature of its terrain of ridges and cycloids. With the encounters, everything changed. Rather than simply talking about planetary bands and spots, the discussion of intricate cloud formations and atmospheric processes took shape. The moons, rather than simply having different colors and, for Jupiter’s big four, barely visible spots, were places that geologists (and in some cases atmospheric scientists) could discuss in concrete terms, rather than mere speculation. 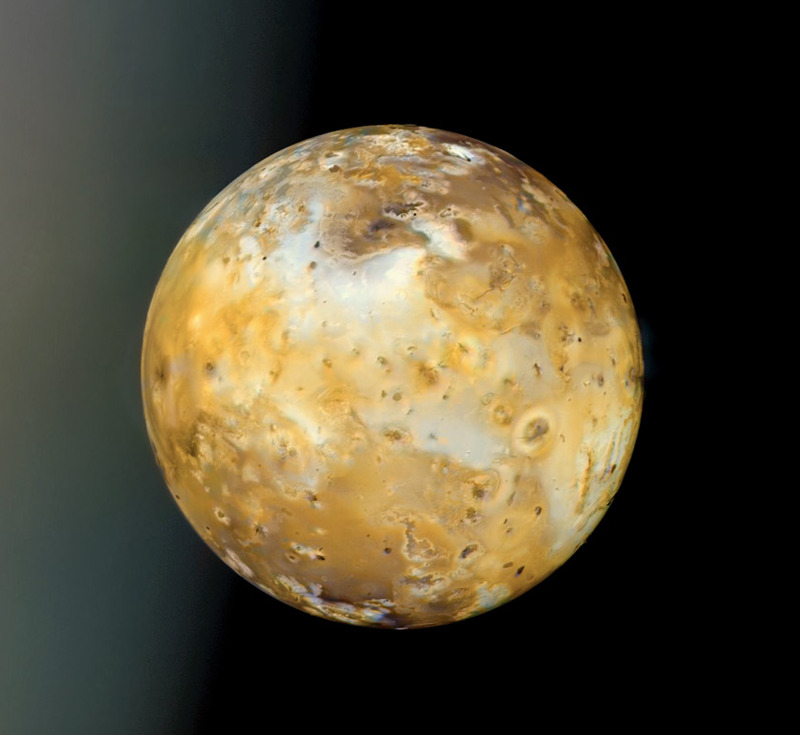 Voyager 1 captured this mosaic on Io on March 4, 1979, as a nearly full-phase Io appeared to travel across Jupiter's terminator. 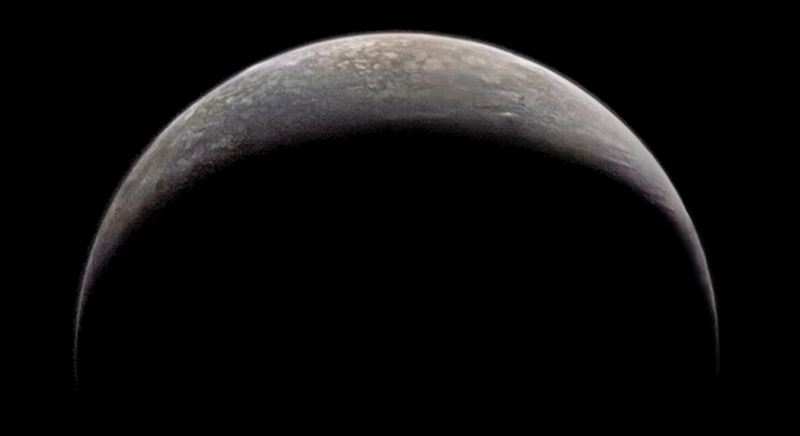 Viewed near the edge of its disk and at local dusk, only the uppermost blue hazes of Jupiter's atmosphere are visible. With little to go on, the solar system had seemed to have a pecking order. 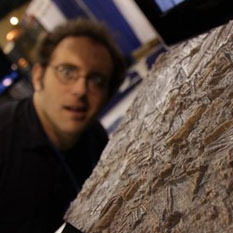 Earth was big and active. Venus was hidden behind its atmosphere, but early radar glimpses of it also hinted at an active world. Smaller Mars had been active at one time, at least in places, and still had a thin atmosphere and polar caps. The moon and Mercury had been dead for billions of years and now simply reflected light and received impacts (so we thought at the time). Voyager 1 had the best view of Dione, capturing two gibbous views near closest approach to Saturn, on November 13, 1980. This is the highest-resolution, a mosaic of 3 frames. Instead we found a complexity that was beyond our wildest expectations. The four Galilean moons of Jupiter -- cratered Calisto, tectonic Ganymede, smooth Europa, and volcanic Io -- looked nothing like one another. Moving out, worlds of similar size -- active Enceladus, cratered Mimas, bizarre Miranda, and lumpy Proteus -- showed incredible diversity. 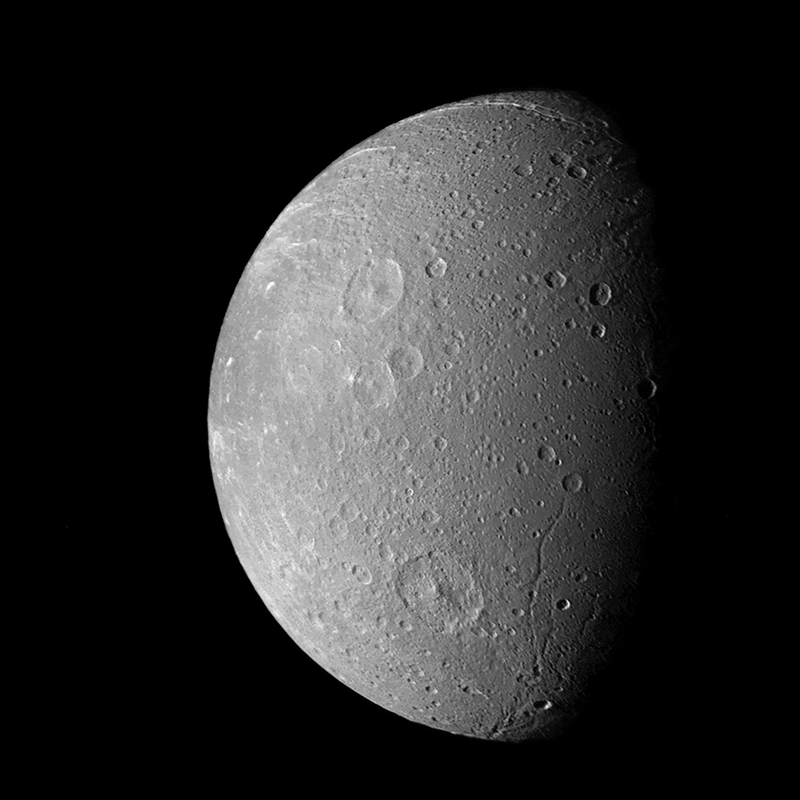 Some were similar -- Dione, Rhea, and Tethys are easy to confuse -- but each has its own style. 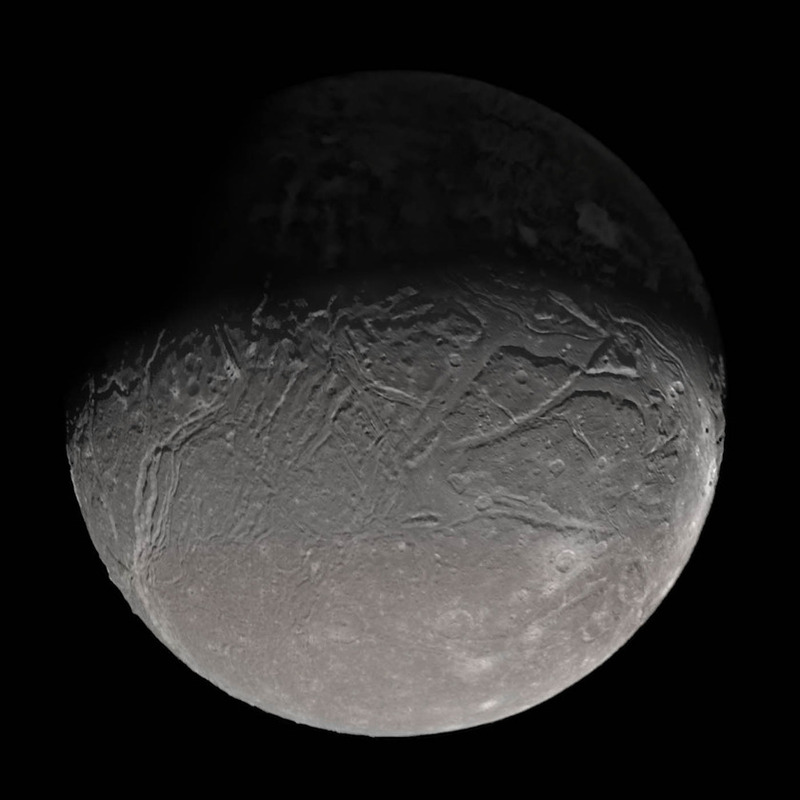 Triton, which formed within the Kuiper belt, looked like nowhere else, with its thin atmosphere, frozen lakes, nitrogen geysers, and “cantaloupe terrain,” including, we now know, a Kuiper belt object of similar size, Pluto. Between 1979 and 1989, humanity’s conception of the solar system became radically more complex. It became clear that it was chock full of diverse worlds that all beckoned for individual exploration, regardless of whether they orbited the sun or another planet. It reminds us that the Kuiper belt, with its diversity of colors, rotation periods, and shapes -- promises to be filled with similar opportunities for surprise and discovery, as we have begun to see with New Horizons, to say nothing of the multitude of extrasolar planets we have discovered. The beginning of this paradigm shift away from predictability and order began with Voyager. From the far side of Triton, Voyager 2 looked back and Neptune's largest moon, sailing away from its final planetary encounter. The photos for this color composite were taken on August 25, 1989.